Acronis True Image Home is a popular disk imaging software for home and personal users that can be used to create backup copy of the system, and allows user to restore or recover to saved state as in a captured image when a disaster struck, such as when disaster struck. The disk image can be created from within Windows or offline by booting from CD/DVD, USB key, USB flash drive, PXE, removable hard disk or other bootable device. Acronis True Image is also been used to clone hard disk content, replicating entire data structure to new disk even if the drive is of different capacity. A license for Acronis True Image Home normally costs $49.99 to purchase. 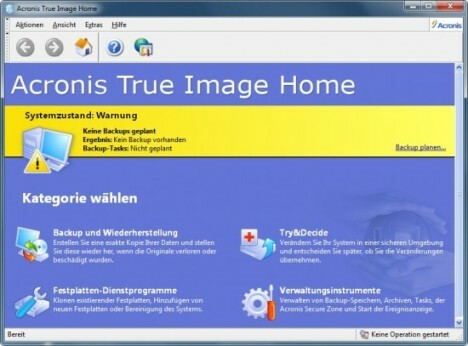 For people who don’t mind an earlier version of Acronis True Image Home, the developer is partnering with German ComputerBild magazine to giveaway free copy of Acronis True Image Home 11 German version. The only caveat emptor is that, it’s only available in German language, and the free registration license serial key number does not work with English setup installer of Acronis True Home Image 11, despite the same version. Enter the “Vorname” (First Name), “Nachname” (Last Name) and E-mail, tick the check box for “Ich habe die Datenschutzerklärung gelesen und akzeptiere sie”, then click on “Registrieren!” button. Check the email Inbox for an email from Acronis, and click on the confirmation link. A personal Acronis account will be created with password printed on screen. Inside the account, it’s possible to review the free serial number for Acronis True Image Home 11. Another email will be sent to registered email with a genuine and legitimate license key for the Acronis True Image Home 11 (German). Download the German setup installer of Acronis True Image Home 11 from one of the download links below. The installation of the software Acronis True Image 11 Home is available exclusively through the cover DVD disc shipped in Computer Bild magazne issue 3/2010, so there is no official download links available. After receiving the free serial key for Acronis True Image 11 Home edition, user is entitled to upgrade to latest version of Acronis True Image Home 2010 for € 29.95.